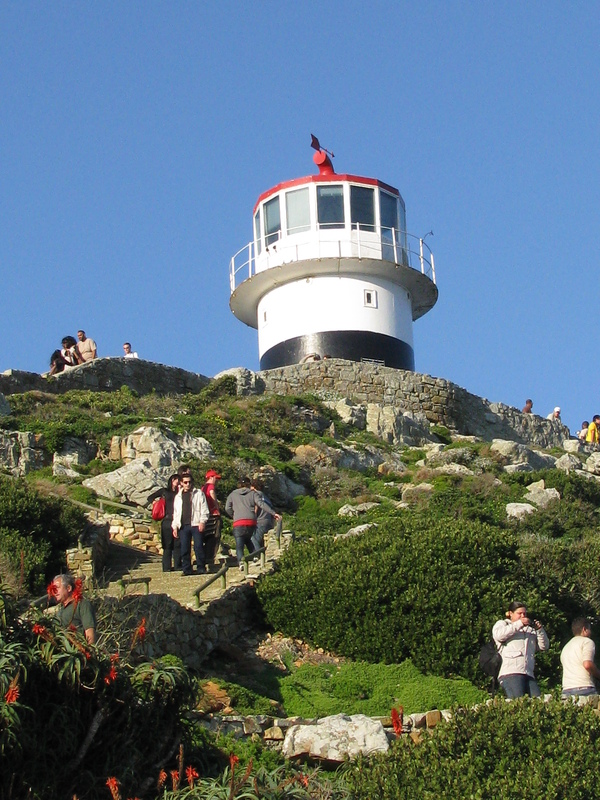 While visiting the Cape of Good Hope, we also stopped at Cape Point to check out the lighthouse. The lighthouse used to be higher up, but had to moved lower since it was seen too early and many ships came in too close causing wrecks. Also, the fog clings to higher elevations. The views from the path are superb. Unfortunately I wasn’t able to climb all the way to the top since I had just started physical therapy for my knee and I didn’t have enough time to hobble up and down before the tour bus left. Even halfway up I saw beautiful views. And now I have a wonderful reason to return–to climb all the way to the top! This entry was posted in Travel Photos and tagged 50 Year Project, Africa, Cape of Good Hope, Cape Point, Cape Town, Life, Lighthouses, Photography, Ship Wrecks, Ships, South Africa, Travel, Travel Blog, Travel Photo. Bookmark the permalink. AHH! A lighthouse, I love them. You just added another one I will have to visit. Your photo is beautiful. I wonder who will get there first? You again or me for the first time. I’m cheering for you. It is beautiful and I would love for you to see it. I’ll do my best. I’m sure it is! Beautiful. Love visiting light houses and learning about their history! They are fascinating. I wish I could visit more. Such a shame that some are no longer around. If I do go back, I’ll be sure to take tons of photos. How unusual, I bet South Africa’s gardens were amazing! They are. I loved all of the gardens and scenery there. It’s such a lovely place to visit. Ooooh, I love lighthouses, and this one looks like it has very beautiful surroundings. Are you going to post a photo of the beautiful views you described? Pretty please :). Well since you said pretty please, stay tuned! Yayyy!! My mom always said that using my manners would pay off :). Did she tell you to eat your peas? She force fed me peas until I was sick LOL. Hence the reason I still hate them with a passion!! My mom forced me until I spit them in her face. Then she gave up. Not suggesting the method to all, but it worked for me. Even the smell makes me ill. LOL!!!! Now that I should have tried. I wish I could have seen your mother’s face the first time you did that!! I don’t remember. I was too young, but I heard about it on more than one occasion. Well that would be a lighthouse not doing its job – drawing seafarers in onto the rocks … is that photo foreshortened (is that a word?) or is it really just a really little lighthouse? Cool place and cool shot! Hope the knee heals soon so you can return for that climb! Knee is a little better now. I’m sure I could climb to the top now. I just have to keep doing my exercises that my PT gave me. This is so cool! Haha. So many people there too. Yes…and lots of baboons! You have to be careful around the baboons if you have food since they will be forceful to get it. Some kid lost his popcorn. Would love to see the view from the top! Take care of that knee TBM. I love lighthouses! I did a picture book review about lighthouses, it’s a nonfiction work entitled Birdie’s Lighthouse. Fell in love with the story. Take better care of yourself, TBM. Hope everything’s well now. The story looks delightful. The knee is better now, but it won’t be back to 100%. Oh well, at least I can climb to the top now if the opportunity arose. Thanks Myra.